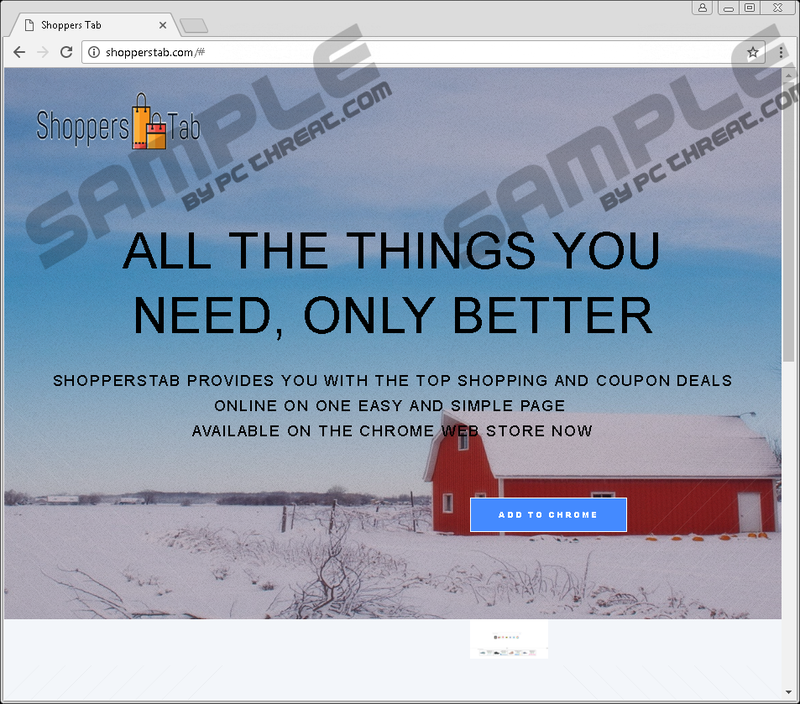 Shoppers Tab is an adware application that runs on your computer as a browser extension. It is promoted as an extension for the Chrome browser, but it does not mean that other popular browsers cannot be affected. The application is clearly a potential computer security threat, so you will do yourself a favor if you terminate this application immediately. What’s more, you should scan your computer with the SpyHunter free scanner to look for other unfamiliar applications, and then remove them all. Adware and freeware usually travel in packs, so if you have one unwanted program on-board, the chances are you have several more. The best way to avoid such intruders is to stay away from their distribution sources. Of course, sometimes it is hard for regular users to determine which websites could be responsible for spreading this adware around. The official website at shopperstab.com does not help us much. It comes with a promotional text and one “Add to Chrome” button that does not even work. The application should also be available at the Chrome Web Store, as well, but that does not mean that users really download it directly. Most of the complaints we have seen about this application is that users have no idea how it entered their computers. 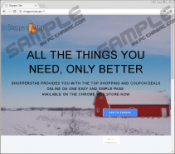 Although it is true that users usually do not intend to have this adware application, they are the ones who allow Shoppers Tab to enter their systems. Adware applications, freeware programs, browser extensions, and other similar apps cannot get installed on a target system unless the users authorize them. Quite often, users do not realize they authorize these apps because they come bundled. For instance, if you download a freeware application from a third-party website, it is very likely that this application will come with additional programs and features, bundled by the third-party installer. Technically, it should be possible to deselect the unwanted applications when you go through the installation wizard, but the tendency is that users skip most of the installation steps because they want to be done with the setup ASAP. Consequently, Shoppers Tab and other unwanted programs enter target computer. Luckily, these applications are not immediate computer security threats, and they cannot destroy your system at once. Their main objective is to generate a financial profit for their developers, so they will focus on that, at first. However, no matter how trivial a program might be, if it is unwanted, it should not be tolerated. What’s more, Shoppers Tab comes from a group of similar apps, which means that there is a consistent effort on the developers’ part to affect as many systems as possible. This extension is almost the same as Finders Deals, TorpedoDeals, Total Deal Search, and a few other browser extensions. So since we knew how to deal with the previously released adware programs, we know how to deal with Shoppers Tab, too. The extension happens to be rather intrusive because apart from displaying shopping deals and coupons, it also modifies your new tab settings with its own search field. After the modification, your web searches will be redirected to ap-client.mobitech-search.xyz. This third-party search engine is developed by Mobitech, and it is not safe. So in a way, we can see that having Shoppers Tab on your computer may lead to certain problems. On top of that, Shoppers Tab could also get exploited by malevolent third parties. This might happen because the extension does not check the origins of the links it displays in its ads. In other words, almost anyone could embed their links in the deals and coupons this extension shows, and if cyber criminals decide to do that, you would be only one click away from a dangerous computer infection. Delete Shoppers Tab right now via your browser’s settings. If you need help with the adware removal, please feel free to leave us a comment below this description. Please remember that this application must have entered your computer in a software bundle, so you should definitely scan your PC to search for other potential threats. Only when your system is safe and clean can you breathe a sigh of relief. Please stay away from unfamiliar websites and invest in a legitimate antispyware tool to avoid similar threats in the future. Press Alt+F and open Manage Add-ons. Remove the app from Toolbars and Extensions. Click the Extensions tab and delete the app. Go to Extensions and remove the program from the list. Quick & tested solution for Shoppers Tab removal.